Knowing customer s expectations and needs, continually providing high quality products. Solving customer complaints immediately, preventing problems from recurring and occurring, and earning customer trust. Developing a quality management system and making consistent improvements of its effectiveness. Setting quality goals from a customer s viewpoint, understanding the condition of achievement and reviewing the appropriateness and adequateness of the goals. Aligning ourselves with the most competent base of suppliers available in the industry - The ability of our suppliers to provide us with quality goods and services is critical to our success. 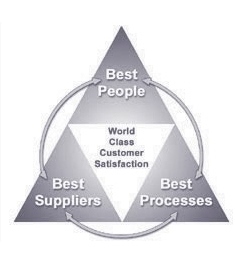 We will strive to achieve excellence in our supply chain with a common vision in the areas of quality, continuous improvement and excellence in customer service.